Around 1915, Hawaiian performers on vaudeville and in other shows made Hawaiian-style songs very popular. Hawaiian music was played with a Hawaiian guitar, an instrument with a long sounding board and six to eight steel strings. The instrument is played by touching the strings with a steel bar or some hard object. 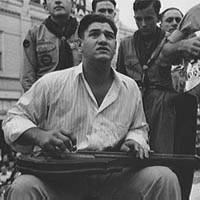 Although it's not clear who invented the steel guitar style, legend has it that the first person to develop this technique was Hawaiian schoolboy Joseph Kekuku. He discovered the sound while walking along a railroad track strumming his guitar with a metal bolt that he found along the tracks. CREDIT: Lee, Russell, photographer. "Cajun Hawaiian guitar player, National Rice Festival, Crowley, Louisiana." October 1938. America, Great Depression to World War II: Black-and-White Photographs, FSA-OWI, 1935-1945, Library of Congress. AUDIO CREDIT: Morgan, Friedland, music; Waikiki Hawaiian Orchestra, performed. "Myona-Hawaiian Waltz." 1921. Inventing Entertainment: The Motion Pictures and Sound Recordings of the Edison Companies, Library of Congress.